This Nuart edition was addressed about power I thought it would be a good idea to approch this topic from an easy starting point going further by connecting it with another concept, feedom. I chose this famous quote, “Your right to swing your arms ends just where the other man’s nose begins” in order to make it more illustrative I would use playmobils, for two reason, their anatomy is much simpler than a human being and these toys were a important part of my childhood, this would be a nice way to pay them tribute. In my experience someone’s freedom ends where its power ends so the best option is to be powerful, not to impose your desires just to avoid anyone imposing theirs to you. This was quite clear for my so following this though I started researching on playmobils, looking for making them more powerful to increase their freedom by improving their joints, at least their elbow (they don’t have) it would be easier for them to pass throughout others nose. These toys only have 4 joints, waist, neck, shoulders and wrist, which make them simple, smooth, handy but also lacking of freedom of movements in pursuit of stability. I started playing with their joints, burning, breaking, pasting and dissecting them trying to find any anatomical key about enlarging their power and so their freedom. I destroyed almost 10 playmobils during my investigation but I just found plastic pieces no even solid as they have gaps in between bodies, I hurt my hand during the process and I ended up a bit disappointed. The only two things I cleared up were that lack of freedom of movement provides stability and how hard it should be to pass through someone’s nose without the articulation of an elbow in your arm. I didn’t get what I was looking for, this image is a witness of what happened, an anatomy study of a playmobil’s elbow, I started trying to increase their power and freedom but I lost stability also the chance to pass through someone’s nose because I didn't know how to fix their arms but there was something enigmatic, I would have to keep looking for from other approach. (Rethinking spaces between arms and noses). Between a playmobil's arms and other playmobil’s noses there are space, air, oxygen, matter, substance… After my failure researching about arms I thought that the key could be in the space between arms and noses, so that is what I reflected on. Walking down the streets I realized how easy can be to keep freedom of movement under control, mainly in developed countries. One of the reasons is trust. First world countries pursuit efficiency, we don’t have time to think about our routes so we trust all those lines painted on the ground, signals, fences, traffic lights, bollards, barriers or security tape telling us whether we can walk through or not. I’m not saying these elements aren’t useful but in some cases I could see overregulation. For instance while I was painting the playmobil’s elbow mural a woman wearing a reflecting vest told me that I was in a security zone (I mean the square I had signalled with closing tape to avoid people bother me while I was painting), so I had to get out of such area if I didn’t want to be fined. This makes me realize how cheap power could be. Security tape is the most meaningful tool, because barriers, walls or lines painted on the ground are grounded and permanent, way more established, but tape is weak and momentary. It could be put by anyone without any infrastructure but we comply with it like if it was a wall because of trust. Thus, I decided to play with this element all over the city, going further in my signalization, trying to rethink cities and how we interact with them. My idea was to install odd, non-sense and awkward “barriers”. In my opinion absurdity is the only way to see from a new fresh perspective, letting intuition and subconscious work, rethinking which standards come from us and which others are imposed. Testing what kind of obstacles impide playmobil’s reach noses. After a few days researching, exploring, having fun with the city and learning how it works, I found my self at the exact same point as I was at the beginning. I didn’t know any key to increase playmobil’s power and freedom. I was stuck. I decided to try a last thing: I would start an experiment based on checking when people stop depending on the height of closing tape. 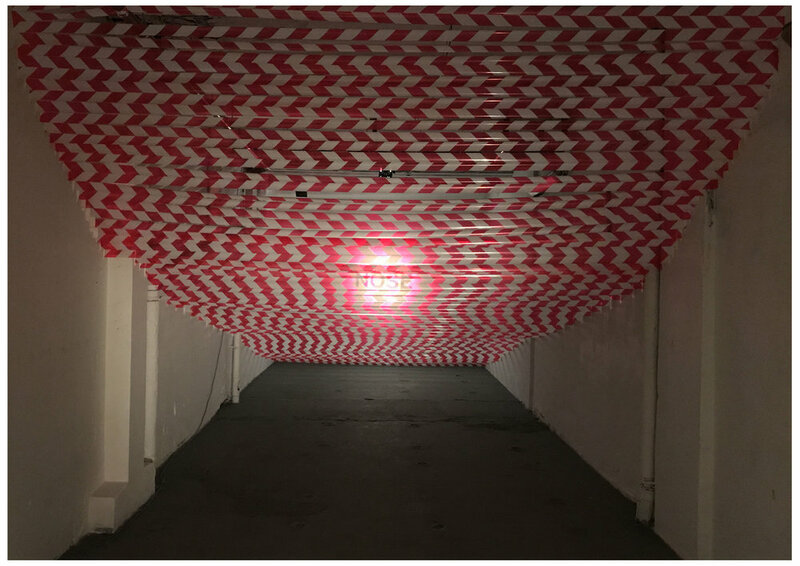 I filled a 15 meter tunnel with bands gradually from the bottom to the top, from the end of the room to the door, in order to check when people start feeling such element as a barrier. I felt like I failed as I couldn’t find the key for power. Nevertheless, while I was giving up I realised I had been so focus just on looking at power and ways to inrease it. I didn’t notice that “the space” didn’t allow me see the other side. But it was after breaking playmobils, walking a few kilometres, annoying people, hurting my hand, etc. that I noticed that playmobils don’t have nose.